Dr. Sam Fecich is the author of #EDUMagic and a professor at Grove City College (PA), works with pre-service teachers in the area educational technology. YOU'RE INVITED TO SUBMIT YOUR FAVORITE #EDTECH TIP, TOOL, APP, WEBSITE, ETC. 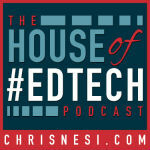 TO THE 5TH ANNUAL HOUSE OF #EDTECH SMACKDOWN!